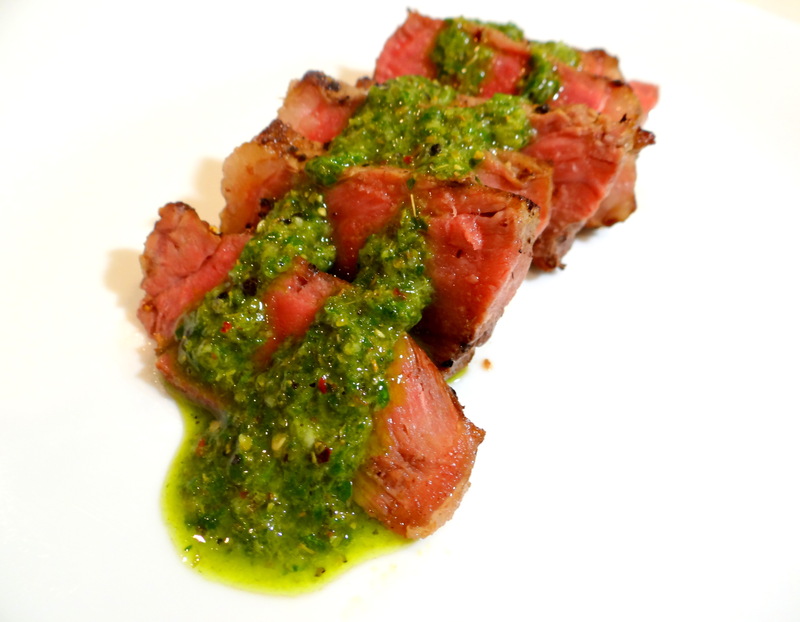 One of the best things served at La La’s Grill is the chimichurri sauce. I could eat bowls & bowls of that delicious sauce with bread. I have been wanting to try making the sauce at home and decided to cook myself a simple dinner: steak with chimichurri sauce. I like to season my steak with some olive oil, salt & pepper. Then I sear each side in an oven proof pan with melted butter and stick in the oven to finish cooking for about 7 min in 350 degrees. 1. Finely chop the parsley, fresh oregano, and garlic (or process in a food processor several pulses). Place in a small bowl. 2. Stir in the olive oil, vinegar, salt, pepper, and red pepper flakes. Adjust seasonings. If you are ever in Pittsburgh – you must do two things. 1.) see me! And 2.) go to Gauchos in the strip district! They have the best steak sandwiches with chimichurri sauce!!!!!! Ouu that sounds yummy! I will let you know of course if I am ever there- miss you! Learn a version of chimichurri based on Cilantro. Some consider it sacrilegious but ill be damned if it isnt my favorite on a flatiron steak…. Keep up the good work. Your fanbase in China grows (even tho wordpress is banned).